You folks are the best! Little wonder it’s my favorite 2 races of the year. Best medals—hands down! Had a GREAT time!! !….thank you so much again…what a great race!!! Nice race on Saturday. Thanks a lot. Another great race! No surprise to us. Good organization, good weather, good food and very spirited. Nicely done by you and the volunteers, and we will continue to support your efforts in promoting health, fitness and fun through your events. Please know that we appreciate your hard work, and that of the volunteers, in making the day a safe and enjoyable one. We look forward to the remaining races of the series. Plenty of treats……and no tricks…… for the inaugural Halloween event. A great day! Thanks. Awesome race!!!!!! I have been doing the Holiday Half for a few years and I look forward to it each year … this was a great “TREAT” for October. Thank you … looking forward to the Holiday Half … I am doing all 4. Hi. Just wanted to tell you I loved the Halfathon. Thanks! Another great job with the Halloween Hotathon at Fort De Sauna! There were at least 17 of us from the Suncoast Striders Club running in the 5k or half – and several of our group who took home hardware (not me – I am a back-of-the-packer and had just run Marine Corps Marathon a week prior!). A few of our group were running in their first half ever – except for the heat it was a great first run for them. Loved the route, loved the Halloween twist on the starfish medals, and of course the volunteers were great and everything was so organized! You also do a great job with communication – thanks so much! Many of us will be back for the Holiday Halfathon – see you then! Peace. I have done a lot of half marathons. This was very well organized. Your follow up is incredible, all to make sure everyone has an opportunity to give feedback. I noticed you even go the extra mile to offer people an opportunity to get the right size t shirts, that is awesome and rare. 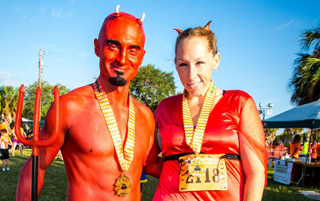 Usually, I love the heat, but running 13.1 miles in a costume … uuugh did my worst time. I will be back to hopefully redeem myself in December. Thanks for all your hard work. Great job!